PT Perusahaan Listrik Negara (Persero) - PLN later known as "PT PLN (Persero)" is the Indonesia Electricity Company, fully-owned by the Government of Indonesia which represented by the Minister of State-Owned Enterprises (SOE). PT PLN (Persero) is the only state-owned company in the electricity power sector and has a right to monopoly on electricity distribution in Indonesia. 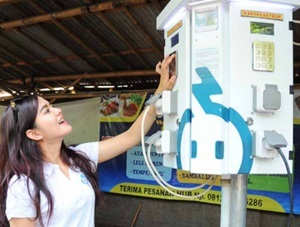 PT PLN (Persero) conducting business in integrated electricity. Its business include generation, distribution, transmission and other electricity related services. PT PLN (Persero) was first established in 1945 as Jawatan Listrik dan Gas under the Department of Public Works and Energy. PT PLN (Persero) is based in Jakarta and its operations are divided into 15 area offices spread across Indonesia. PT PLN (Persero) now has 6 distribution unit offices, 2 Distribution and Load Control Centers, 6 Generation units, 14 Parent Project Units and 6 Central and Services Units spread across Indonesia. PT PLN (Persero) also supported by 11 key subsidiary companies. In term of financial performance, PT PLN (Persero) maintain consistency in making positive performance. According to information found in PT Perusahaan Listrik Negara (Persero) Annual Report 2017 as cited by JobsCDC.com, PT PLN (Persero) successfully recorded a total asset of Rp1,334.96 trillion in 2017, with a noticeable increase of 4.93% from Rp1,272.18 trillion in 2016. PT PLN (Persero) managed to record a total revenue of Rp255.30 trillion at the end of 2017 or equal to an increase of around 14.6% compared to Rp222.82 trillion in the previous year. D3 degree in Electrical Engineering. S1/D4 degree in Electrical Engineering. S1/D4 degree in Electrical Engineering, Electronics and Instrumentation. D3 degree in Mechanical Engineering. D3 degree in Management, Business Administration, Commerce Administration. S1/D4 degree in Commerce Administration, Management, Industrial Engineering. D3 degree in Communication, Visual Communication Design. JobsCDC.com now available on android device. Download now on Google Play here. Please be aware of recruitment fraud. The entire stage of this selection process is free of charge. PT PLN (Persero) - Fresh Graduate Program Integrated Career Days PLN October 2018 will never ask for fees or upfront payments for any purposes during the recruitment process such as transportation and accommodation.